Amazon Description: We now are in the era of service innovations and service models that are enabled by AI and cognitive computing. Some analysts have created fears of a replacement of human workers by smart machines, with a consequent loss of jobs and of morale among the population. 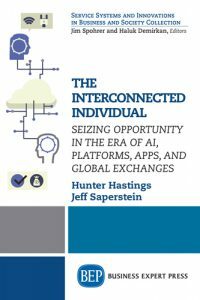 In Seizing Individual Opportunity in the Cognitive Computing Era, Hastings and Saperstein explain why the opposite will be the case, and how individuals in all walks of life will find new ways to thrive with the help of cognitive assistants. 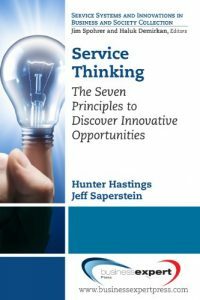 This new book builds on the Service Thinking framework to focus upon the opportunity for individuals to augment and empower themselves by utilizing emergent cognitive computing capabilities. They may work in an enterprise, own a small business, lead a start-up, be a freelancer, or an individual customer of services who will benefit from the cognitive augmentations becoming available. In all cases, it’s a positive, optimistic and empowering message for individuals. The adaptive T-shaped individual will enjoy a cognitively augmented future if they seize the opportunity. I recently read the Interconnected Individual and found the work to have strong depth and breadth of current issues we face in our professional lives (yet most of us haven’t spent the time to consider). It also serves as a thought-provoking exercise in awareness and reflection, while offering pragmatic insights and exercises to help readers look forward, design, and plan their career path. I was particularly drawn to the conversation around values-based career navigation. Amazon Description: Business paradigm shifts are rare. However, the shift to a services-dominant economy and to services-dominant value creation genuinely merits the designation. Almost 80% of GDP in developed economies is attributable to services, and some economists regard products as merely the physical embodiment of service delivery. Yet today’s business analysis, business management, business organization, business processes, and business education emerged from manufacturing-dominant logic; the principles of service are often under-served and poorly understood. This results in lost opportunities for growth. Service Science, Management and Engineering (SSME) has been slowly bubbling up and building learning and knowledge in academia for 30 years, with an acceleration in the last ten years. The disciplines, principles, insights and tools of SSME are now ready to transition to the mainstream business world, with transformative effect. This is a must-read for anyone trained in traditional process improvement or business architecture […] I intend to buy a copy for every member of my team. Amazon Description: For the first time, marketing can systematically drive top-line revenue growth and long-term business value. Finally, your organization can have a marketing discipline that begins with customer insight and leverages the full benefits of process, creativity, measurement, and collaboration. 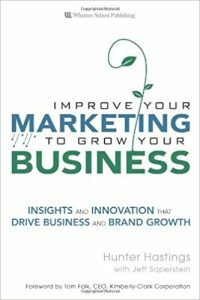 In this book, legendary marketing innovator Hunter Hastings helps you build that revolutionary marketing organization and use it to achieve unprecedented business results. Discover how to integrate marketing and customer knowledge into everything your company does…leverage technology to identify breakthrough opportunities and marketable innovations…learn faster, act faster, and drive maximum value from every marketing investment you make. Marketing is part art and part science. The ‘art era’ was ok in the 20th century. If you need to consistently generate growth and increased profitability in this century, you better stick with the science. When cost cutting is not enough to improve the bottom line, it is time to focus again on the consumer. Improve Your Marketing to Grow Your Business shows how to go from consumer insights to relevant innovation and actionable marketing plans. Metrics to measure marketing effectiveness complete a must-read book. Why Demand Creation is the next paradigm for organic organizational growth. How long-established companies with legacy systems create structural and cultural barriers that make Demand Creation adoption more difficult than in newer companies. The essential role of senior management in Demand Creation adoption. How Demand Creation can be applied to brand building through the application of process and cross-functional integration. 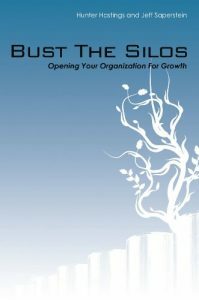 Bust The Silos is a must read for managers, staff, and executives who want to understand how organizations have embraced “Demand Creation” as a new paradigm to support competitive advantage in the 21st Century. In this easy-to-digest book, the authors provide rich, detailed examples of how such companies as Genentech, Cisco, and Clorox have applied the principles of the “Demand Creation Model” by focusing on creating: role-based functions rather than jobs, multifunctional teams rather than departments, networks rather than silo structures, value through intangibles, and innovation though a customer centric orientation.